This was my first experience walking in alpine pastures, high in the Triglav National Park of Slovenia. My lasting memory of the trip was the incredible sense of peace in the area. The connecting network of gravel tracks meandering through the trees connecting wooden cottages and farms felt a long way from the urban landscape of home. The route was around 12km in total and took around 3 hours (excluding lunch and photo stops), it was a perfect morning hike and we enjoyed lunch at the half way point overlooking the beautiful pastureland. 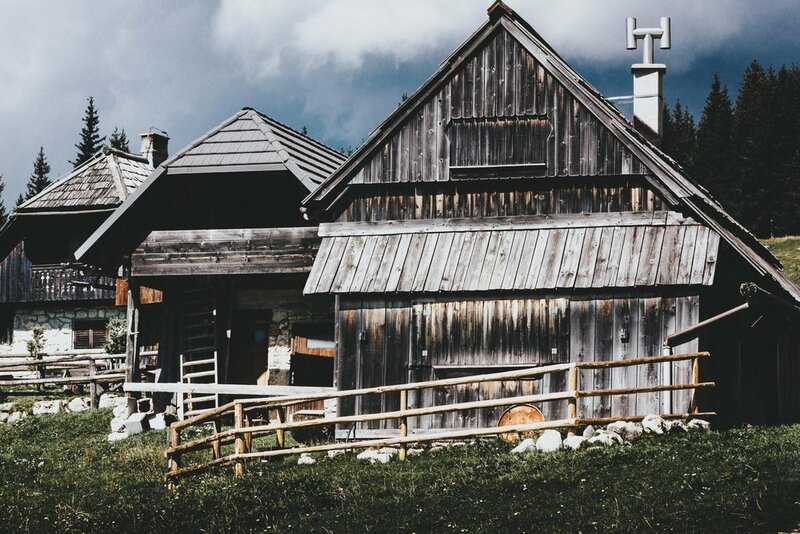 The planina's of Slovenia are summer pasture areas where farmers allow their cattle to roam whilst they stay in the beautiful wooden cottages. 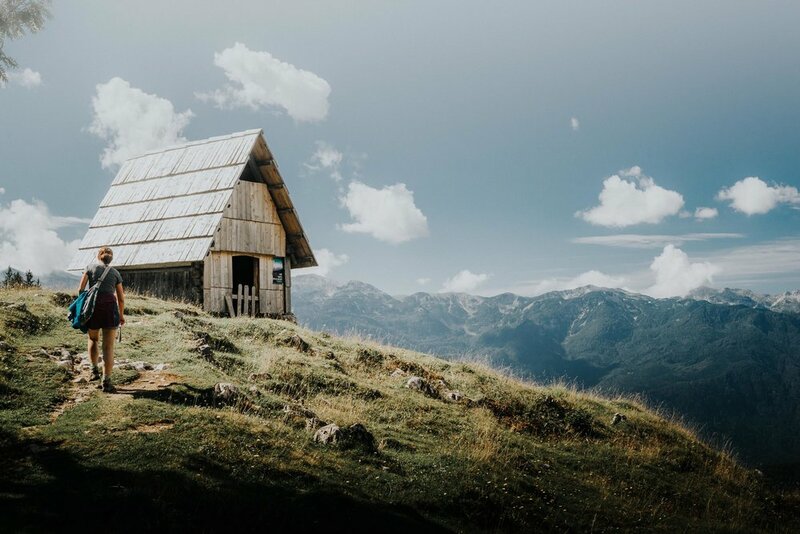 Set high among the mountain areas of the Julian Alps, the backdrop for these peaceful settlements is the dramatic alpine ridges including the Triglav massif itself. If you visit Slovenia in summer I would highly recommend a visit to any of the planina's to appreciate how far away this feels from much of our usual daily life in urban areas. Each cottage has it's own style and decoration, and while they are seemingly being modernised, they blend in perfectly with the natural surroundings. The walk in was easy to follow and passed through alpine woodland, fields and a scattering of other small farm buildings in the area. Our starting point at Rudno Polje in the Pokljuka area of the park is only a short drive from Bled and also a popular starting route to climb Triglav (highest mountain in Slovenia at 2,864m). Leaving behind the Vojašnica Pokljuka sporting facility and car park into the woods. The sporting facility is a large complex with residential facilities and a base of Nordic Walking and Cross Country Skiing. 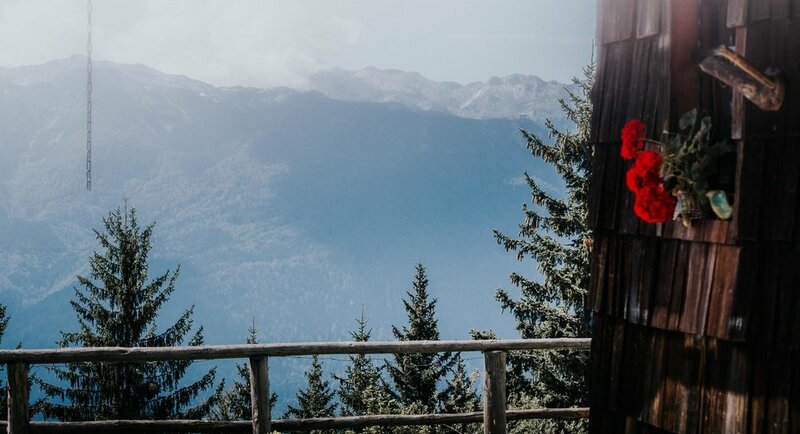 Finding that facility located deep in the woods of the Triglav National Park was a suprise considering how substantial the complex was. A short distance into the walk, the woodland breaks for a narrow clearing as you head downhill deeper into the valley. Time for a brief rest and to appreciate the surroundings. We enjoyed a bright sunny September day of walking, perfect conditions to take our time. Our first Slovenian cow encounter as these pair enjoyed a rest and recuperation by this small pool of water. Not knowing how friendly these locals were, we gave them a wide berth. The skyline was soon dominated by the light grey tones of the mountains of the Julan Alps set all around. The tracks through the woods cris-crossed around and many were suitable to drive which was a surprise given how remote the area felt. I even managed to use one of my Slovenian phrases with two passers by who asked for directions. Of course they assumed I was Slovenian (ha) so I had to ask to switch the conversation to English in my best Slovenian tone. Reaching the lowest level of the walk we meandered through the scattered farm buildings set beautifully between the trees. In the background the ridge of Triglav itself overlooked us. Leaving the open pastures behind again the climb up to the planina began. Concealed among denser woodland the path was a steep climb. We bumped into a few other walkers, the odd car and a red squirrel on the way. As we emerged from the woods we caught our first view of the Planina. Not knowing exactly what to expect I was taken aback by the beautiful setting and the hive of activity. The owners were improving and maintaining the idyllic structures, smoke slowly rising and gardens being tended to. 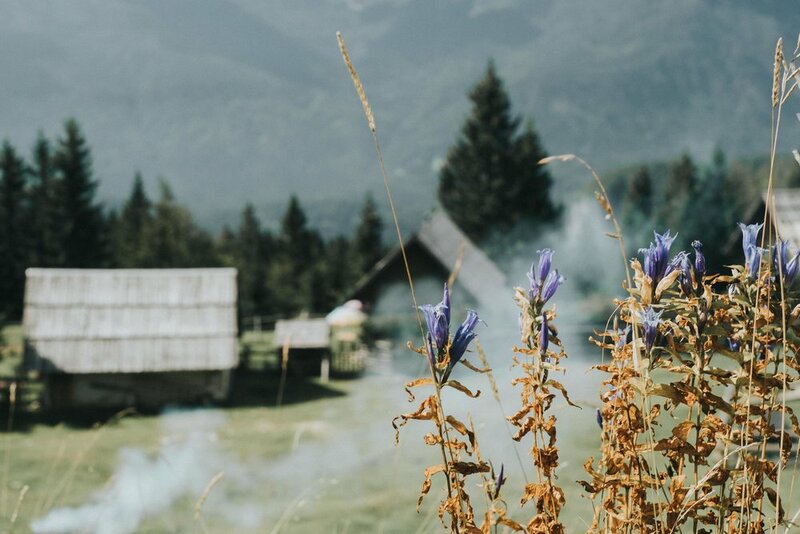 Set against the stunning backdrop of the Julian Alps, this little paradise of open pasture felt like the only place to be on this sunny day. The majority of the cottages were constructed of timber, with a rare stone walled cottage here and there. Signs of life existed all around the cottages, creating a warm community feel. Many of the cottages were perhaps being tended to as the season came to a close, prepping them for the winter and snow that was ahead. Pretty purple wildflowers and Idyllic shepherds cottages set amongst the Julian Alps. Looking back across the planina towards Triglav and the path that lead us to the pasture. 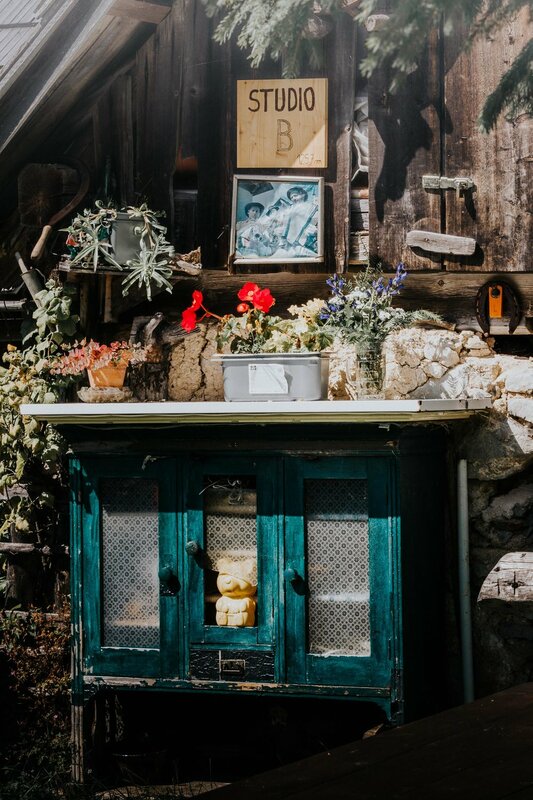 This little wooden hut is perched perfectly overlooking the entire planina, the ideal spot for sandwiches and a little cool beer. 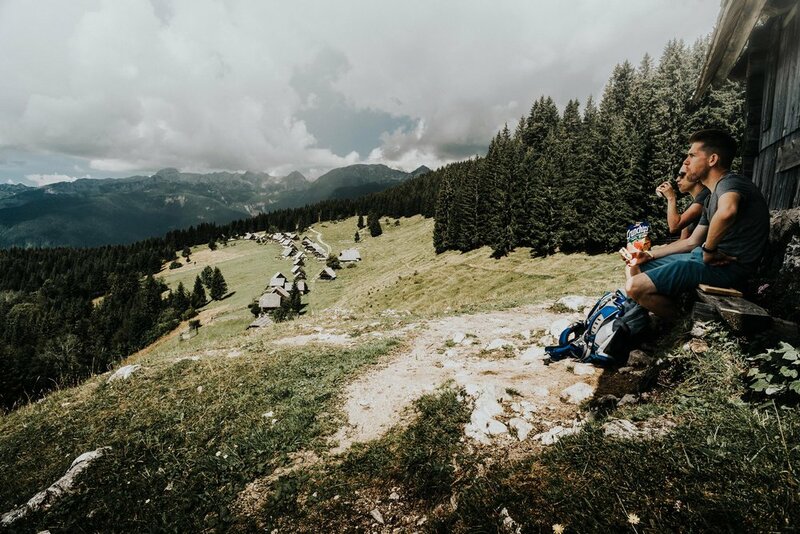 A moment I will remember for a long time as we enjoyed the view over the planina with a cold beer and sandwich in hand and the gently ringing of the cow bells close by. My happy face mid lunch and beer. Living classly like, with crunchips, sandwich & beer. One of the best lunches I've ever had. From up here the mountains of the Julian Alps didn't seem quite so daunting as driving along the valleys and the sky opened up. ... well, in summer at least. Alas it was time to pack up the bags and start to wander back through the cottages. Many of the cottages were boarded up as we were visiting in September towards the end of the summer season, yet they still looked incredibly homely. Farming and essential tools for a life here high on the pastures of the alps. An odd couple sat watching us as we made the return journey., Looks like they have been here a while. Summing up the feel of this peaceful and calming place. A wall of mighty alpine mountains seemed to encircle the area on three sides and far into the distance. The cottages here seemed incredibly well looked after and loved. I discovered afterwards that many are let our to visitors to stop in for a few nights in summer. Next time! The summer residence for the farmers of the alps. 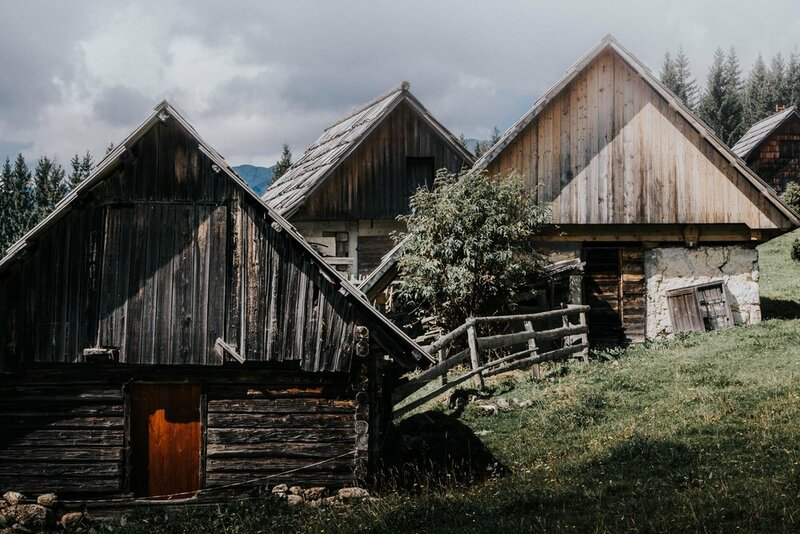 Tending to cattle and making diary products inside these beautiful huts and surrounded by alpine mountains. The roof of this cottage was still being repaired as we walked back through the planina so I took another closer photo as I couldn't believe the backdrop. As we made our way back through the lane of houses and back into the woods, it felt like the walk had been well and truly worth it to experience the peace and quiet of this place. The return back to our start point was along the same route and seemed much faster. The full route we followed was walk 03 from the Sunflower Landscapes - Slovenia Walking Book and around a 30min drive from Bled.